Chief executive Roger Lewis says the Welsh Rugby Union are hoping to host a European football final at Millennium Stadium. 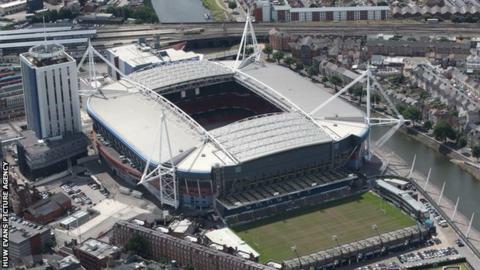 The Cardiff venue missed out on hosting matches for the 2020 European Championships. A new pitch has now been installed at the ground and Lewis is hopeful. "The noises we are getting at the moment are hugely encouraging," said Lewis, who is stepping down from his role in October. "I'm feeling very good about bringing quality European football to the Millennium Stadium," he told Radio Wales Sport. Millennium Stadium has a capacity of 74,500 and has hosted a wide range of events including the FA Cup Final, League Cup final, Community Shield and Football League play-offs from 2001 to 2006, while Wembley was being redeveloped. Any formal bid for the Champions League or Europa League finals would have to be made by the Football Association of Wales, with the WRU - as owners of the stadium - offering support. Lewis said bringing one of European club football's top finals to the Stadium has been a target for a while. "This is something we've been working on for quite some time," he said. "We've invested heavily in the facilities at the stadium. "The pitch is fantastic. We've now got this fantastic Desso pitch and I think it's one of the great pitches in Europe. "The noises I've been receiving over the past few days are hugely encouraging and I hope fingers crossed, it's a question of watch this space."